Lock Column in Excel (Examples) | How To Lock a Column in Excel? How to Lock Column in Excel? Sometimes we work on such projects where data protection becomes very important. In such kind of work, if someone makes any changes in data which is not right, then undoing those changes will not work if the file is shared and saved in a shared location. Here Locking function comes with the feature of data protection. 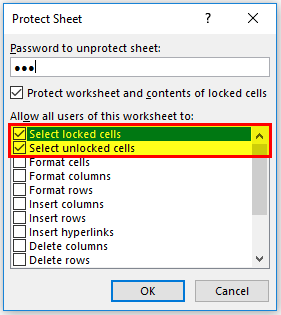 We can lock any cell, column or sheet in excel as per our preference so that unauthorized access will not be able to make any changes in data. 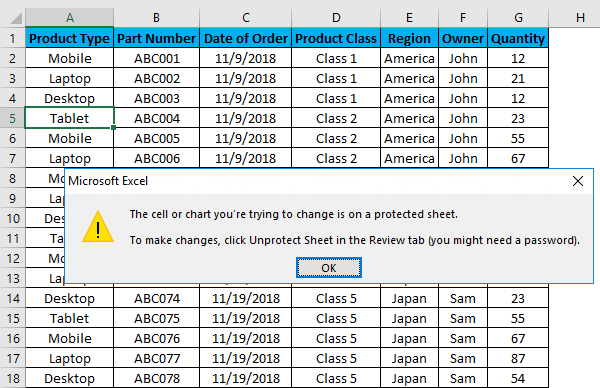 Excel Column Lock is available in Review Menu, under Changes section. 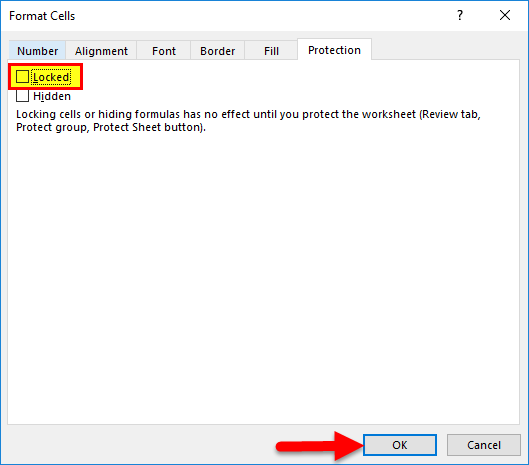 And another way is by going to Format cell option and locking from there. 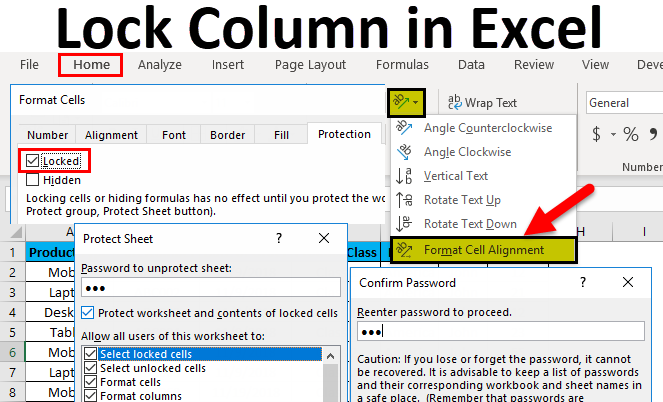 To Lock a column in excel is very simple and easy. 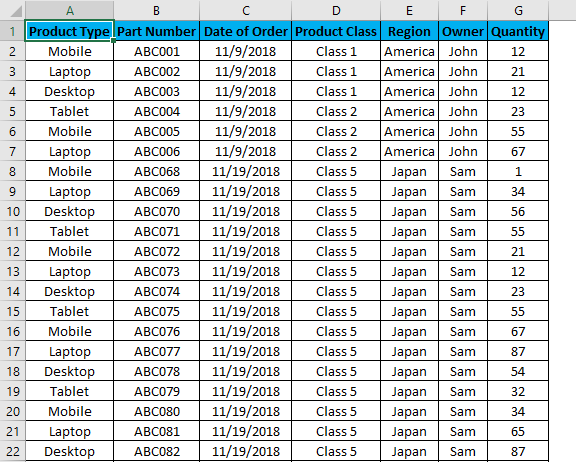 Let’s understand how to Lock Column in Excel with some examples. We got a sample sales data from some products. Where we have observed that the Product Type column many time got changed by multiple logins. So, to avoid this, we are going to lock that Product Type column, so that it will not be changed by anyone. And data available after it will be accessible for changes. Below is the screenshot of available data for locking required column. 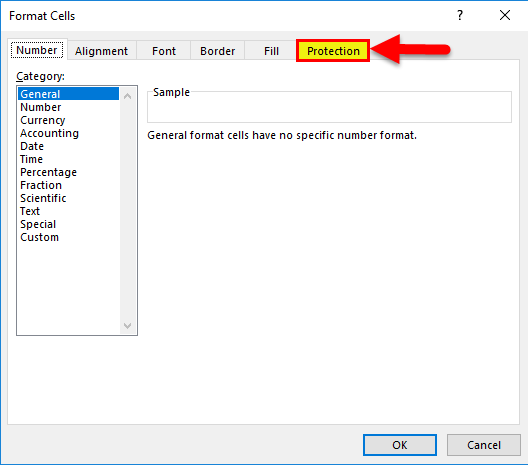 For this purpose, first, select a cell or column which we need to protect and then go to the Review tab and click on Protect Sheet. Once we click on Protect Sheet, we will get a dialog box of Protect Sheet where we need to set a Password of any digit. Here we have set the password as 123. And check (tick) the options available in a box as per requirement. For example, here I have checked Select locked cells and Select unlocked cells (which sometimes comes as default). 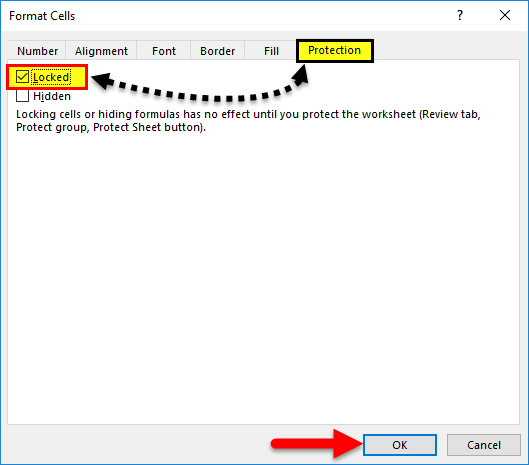 Once we are done with selecting the options for protecting sheet or column, click on OK as highlighted below. 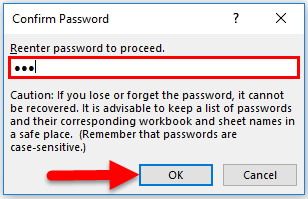 Once clicked on OK, the system will ask you to re-enter the password again. Once fed the password, click OK.
Now selected Column is locked and no one can change anything in it without disabling the column’s protection. Let’s check, whether the column is actually protected now. We had chosen Column A named as Product Type as required. For checking it, try to go in edit mode for any cell of that column (By Pressing F2 or double click), if it is protected we will see a warning message as below. Hence, our column data is now protected successfully. For unprotecting it again go to the Review tab and click on the Unprotect Sheet as shown below. Once we click on the Unprotect Sheet, it will again ask the same password to unprotect it. 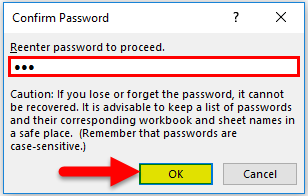 For that, re-enter the same password and click on Ok.
Now the column is unprotected and we can make changes in it. We can also check the column whether it is accessible or not. Apart from the method which we have seen in the above example, we can lock any column in excel by this too. 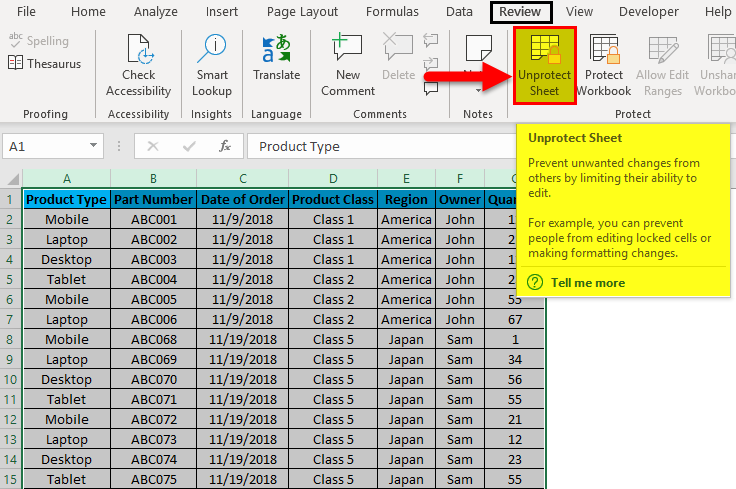 In this method, we will lock the desired column by using the Format Cell in Excel. 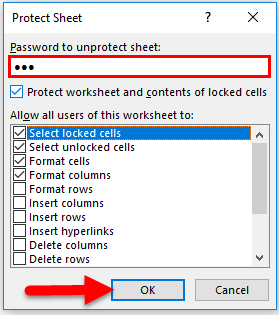 If you are using this function for the first time, then you will see your entire sheet selected as Locked, if you go and check in Format cell. For that, select the entire sheet and go to the Home menu and Click Orientation icon as shown below. After that, a drop down will appear. From there click on Format Cell Alignment, as shown below. 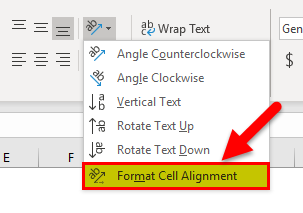 Format Cell Alignment can be accessed from different method as well. This one is a shortcut approach for doing it. For this, select the entire sheet and Right Click anywhere. 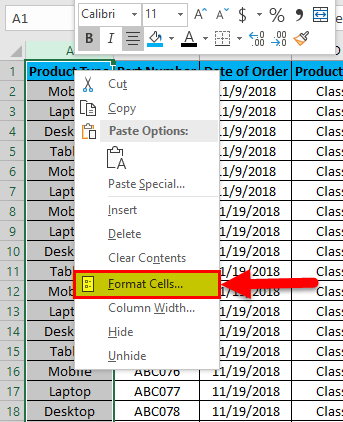 We will have Format Cells option from right-click menu as shown in below screenshot. Click on it. Once we click on it, we will get a dialog box of Format Cell. From there go the Protection tab. If you find Locked box is already checked in (which is default set) then uncheck it click on OK as shown below. By doing this, we are clearing the default setting and customizing the sheet/column to protect it. 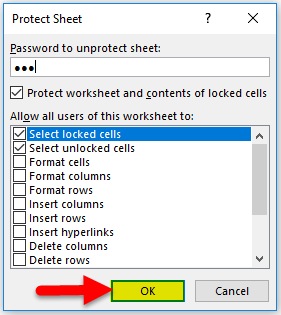 Now select the column which we want to lock in excel. Here we are locking column A named as Product Type. 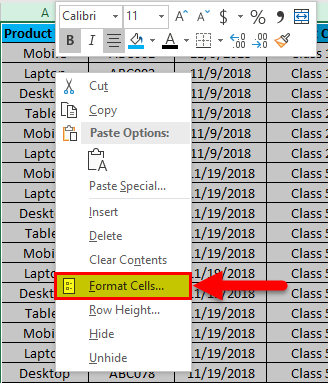 Right click on the same column, and select the Format Cell option. After that, we will see Format Cell box, from there go to the Protection Tab and Check-in Locked box. And again click on OK, as shown below. Follow the same procedure as explained in example-1. Refer below screenshot. 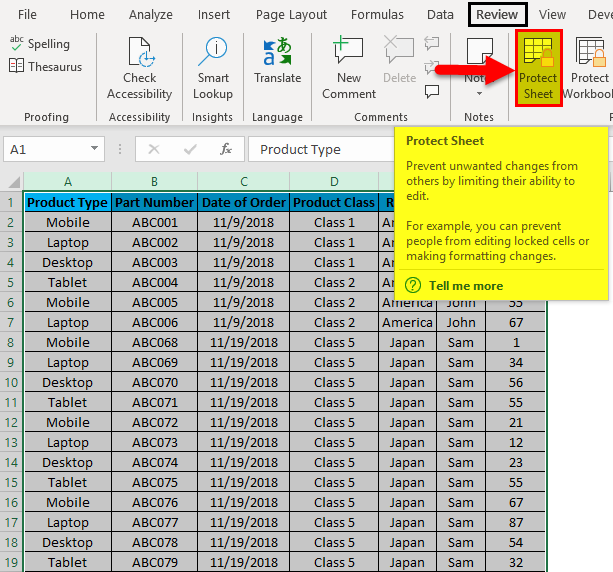 Re-enter the password and click on Ok.
For checking, we already chosen Column A named as Product Type as most of the time the data available in Product Type gets disturbed. If it is protected we will see a warning message as below. So, we will have our column data protected and locked for making any changes. For unprotecting it again, follow the same procedure as explained in example-1, as shown below. It helps in data protection by not allowing any unauthorized person to make any changes. 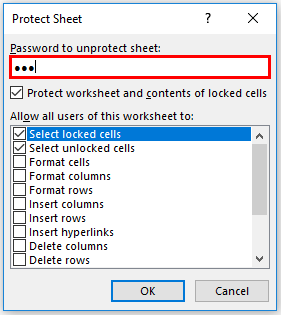 Sometimes data is so confidential that, even if a file is shared with someone outside the company, then also a person will not be able to do anything, as sheet/column is locked. Sometimes sheet gets so locked that, even in an emergency, we would not be able to change anything. If we forget the password, then also there is no way to make changes in data. There will be only one way, which is to create a new file with the same data to proceed further. Always note the password, if you cannot remember it in long future use. Always have a back-up of the file which is locked, without any password, so that it will be used further. There are no criteria for creating a password.